Time's Up! Early Bird Deadline Midnight Tonight! Published on November 30, 2018 at 12:00 am . November 30, 2018 — Only hours remain to enter the 2019 Calendars for Cause Sweepstakes! 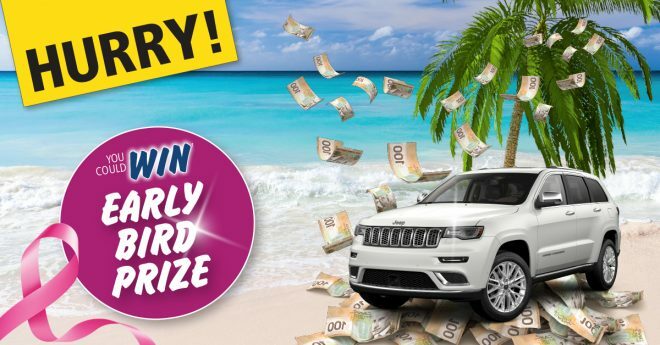 Get in before MIDNIGHT TONIGHT and you could win† the Early Bird dream prize package: a 2019 Jeep Grand Cherokee, an all-inclusive trip for two to Mexico and $5000 cash! When you purchase a calendar, you are also entered to win† $1000 CASH daily, TRIPS weekly, CARS bimonthly, and the $10 Million Grand Prize Draw†! Hurry, the deadline to enter is midnight tonight, November 30! Your generous support will help fund the life-saving initiatives of breast cancer charities to make an even bigger impact, while getting a chance to win these incredible prizes! Help them reach their 2019 goal of raising $2 million for Shop4Charity’s charity partners. †No purchase necessary. Math skill test applies. Prizes may not be exactly as shown. See Official Rules for details. Last Weekend to Win the Christmas Bonus. Become a Multi-Millionaire!